As stated in the short paper On Being an Authority, I have no intention of being a person who presents the data and then says no other data exist or that no one should look and discover for themselves what is real (real for this purpose is defined as actually observed as occurring in the physical universe by you and everyone else). In discussion of various mechanisms, I seemed to have missed a basic underlying datum held/put forth by quite a few doctors. That a vertebra cannot slip anterior due to the resistance of disc fibers and other tissues. The reasons that is not true are evident on physical observations. What is true is that ligaments prevent a bone from moving very far out of place unless they are badly stretched such as in a dislocation. BUT, this does not mean that they hold bones in an optimal position for mechanical leverage. This is seen in many examples and Milkmaid’s Arm is one of those. Next is the point that if the discs were to be said to be resisting these motions so anterior slippage would not be possible, we would not have anterolistheses/spondylolistheses visible on plain film x-ray, with or without lysis of the pedicles. For that matter we would not have retrolistheses/posteriolistheses visible on plain film x-ray either. 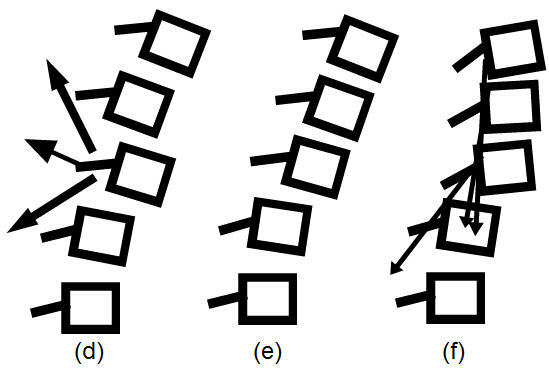 Actual observation of physical experiments and clinical x-rays as noted above demonstrate vertebrae can and do move in any direction (anterior included) with a twist or without a twist and with flexion/extension or lateral flexion/extension or without. The spinal column and individual vertebrae are loaded axially (top to bottom) by gravity. The tension of the meninges/CNS being stretched from head to tail also pulls the ends of the spine together. There are also muscles on the posterior aspect of the spinal column which pull inferior-superior (accounting for the axial loading in nonupright positions). There are addition factors to consider in the pulling inferior-superior on the column such as the anterior and posterior longitudinal ligaments and the anterior body musculature. To the left in (a) you have the arrows indicating the force of the meninges pulling the spine inward just like a stretched rubber band. 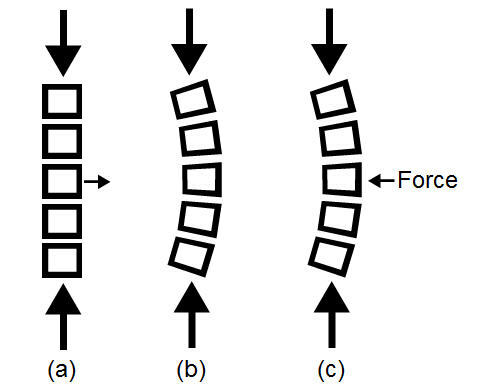 To the right you have the effects of that force on a misaligned spine in (b). Yes, the vertebrae on the inside of the curve do compress. Practitioners tend to forget that vertebrae are not of set shape and solid, they are compressible to a great extent. That is what accounts for the changes in compression seen when you take sitting films and then standing films. The forces have changed and the shape of the vertebrae are changed a bit as well. Attempting to correct by forcing the vertebra left as in (c) can only be done if the force of the axial compression indicated by the large vertical arrows is exactly aligned — which it will not be unless the vertebrae above and below the misaligned one are exactly held in place by some outside force. Since that force will not exactly align as you attempt to force the displaced vertebra left laterally, the force will usually displace some other vertebra BUT IN A DIFFERENT PLANE. Pushing it forward, backward or in some type of twist. That is why mirror image forces to correct vertebral and spinal alignment have not worked on any sort of consistent basis in the thousands of years it has been attempted by various groups. The force pushes the vertebra further out of position as it squeezes the ends of the spinal column together. To visualize this see above and imagine a stack of blocks with rubber bushings between the blocks that are attached at to the end of the blocks it is between. Pardon the crude graphics. You may need to widen your viewer to the max width to see this as it should be viewed. That discusses lateral displacement. Now let us look at anterior-posterior displacement. If you consider that there are muscles on the posterior aspect of the spinal column pulling inferior-superior and there are no similar muscles on the anterior aspect (though there is the anterior longitudinal ligament to provide some inferior-superior pull) the axial compression forces the vertebra already displaced anterior further anterior or lateral as in the figure to the right below. The illustration to the left is what practitioners think of when they think of a vertebra stuck anterior but that is not how it works. The spine above the anterior does not stay stable in place. Since the column above the point of the anterior is dependant upon the support of the vertebra below, the entire column from that point up is stuck forward. The illustration to the right is the more accurate. 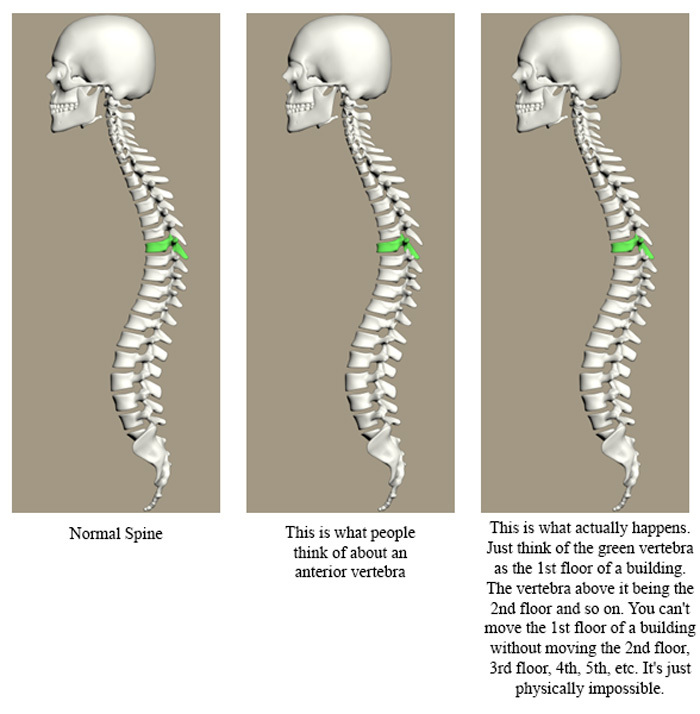 People tend to think the spine looks like the illustration left above or in (d), when a vertebra goes forward. That gives them the impression the muscles from the vertebra above and below can contract and that will pull posterior (in the directions of the long arrows) pulling posterior (short arrow) and returning the vertebra to its proper position. It is absolutely incorrect. Again, the vertebra above are dependant upon support from the ones below. Therefore, when a given vertebra goes forward the ones above follow and cannot act as a stable base from which other muscles can pull as in (e). What can, and most often does happen, is illustrated here in (f). The muscles pulling from one vertebra to another contract. This rotates the vertebrae into extension. That tilts the vertebrae posterior and leans the entire body backward. This is how a spinal column gets flat spots in what is supposed to be a smooth curve from the lateral view. This indicates that just at the bottom of a flat spot is a vertebra stuck anterior (and not posterior as Gonstead claimed).